Why does the Revlon Salon One-Step Work So Well When Drying and Styling Hair? Are you always in a hurry when it comes to getting ready to leave your house each morning? That means you can probably use a hair styling tool that will save you some time getting ready. Fortunately, there are such handy hair styling devices available in the beauty marketplace. One of those is the Revlon Salon One-Step Hair Dryer & Volumizer. We have been hearing many good things about it so we decided to take a closer look at it. This is a pretty unique 2-in-1 hair styling tool from the reputable hair products company Revlon. 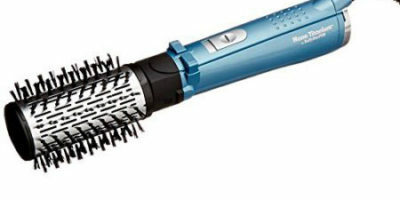 It features some great hair drying power and an excellent dual-bristle brush design. The bristles are made up of both nylon pin style and tufted bristles to keep your hair from getting tangled as you dry and style it. The Revlon Salon One-Step Hair Dryer & Volumizer also features such handy technology as ceramic heater coating with ionic infusion. This allows this hair dryer to produce hot drying air very quickly after turning it on. There are also 3 different temperature settings (high, low and cool) to allow you some styling flexibility. This hot air brush has a great shape to it that makes it very comfortable to use. It weighs 1.8 pounds which is slightly above average for these types of hair styling tools. The brush shape on it is also very unique in nature. It has an oval design so you can really get down close to the roots as you dry and style your hair. Temperature selection is done by the means of a simple switch. There is also a very nice length power cord that comes with it. It features an 8-feet long power cord with attached swivel end. That means you will have no movement restrictions when using the Revlon Salon One-Step. There are many reasons why this hot air brush works so well at drying and styling your hair. One of the biggest factors contributing to this is its 1100 watt blow drying power. That is as much power is you will see in any dedicated hair dryer. Having that type of blow drying capacity in a hot air brush is a big bonus and will really contribute to drying your hair quickly. One of the other most important features of this hot air brush is its ceramic/ionic technology. 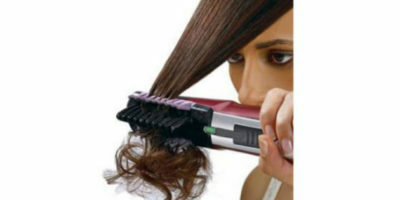 It allows this hair styling tool to heat up quickly and do it in a way that does not damage your hair. This technology also helps reduce frizz, split ends and fly away hairs due to static electricity. It will even give your hair some added shine as you style it. 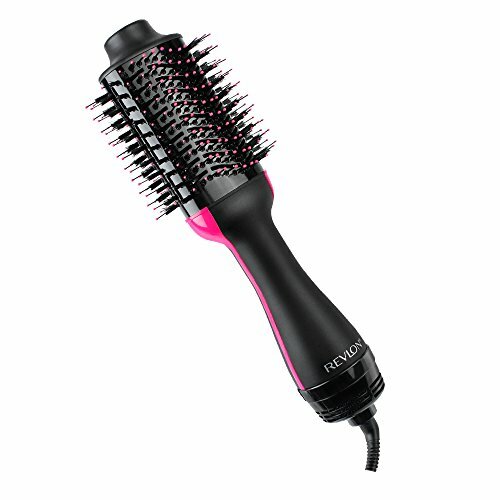 This product from Revlon has a very good warranty on it for a hot air tool in its price range. Revlon stands behind it for a period of 4-years. That is much longer than the average warranty you will find for these types of products. One of the things we did notice with this hot air brush is it can start to feel a little heavy after using it a while. This is due to its 1.8-pound weight which we feel is a little to the heavy side. Another disappointment with this particular hair brush is that it can only be used in 120V outlets. That means you cannot take it with you if you travel to most other countries. A dual voltage design would have made this an excellent travel dryer and styler. The Revlon Salon One-Step is a handy hot air brush to own. Everyone here thought it would be a great hair styling tool to own. It features incredible drying power and well-dispersed venting that will enable you to brush and dry your hair very quickly. 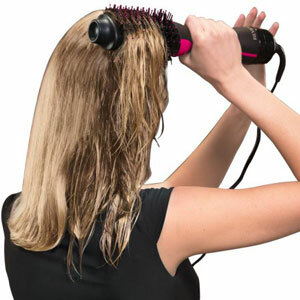 The ceramic/ionic technology will help you protect your hair from heat damage as you use this hot air brush also. The 4-year warranty you get when purchasing it really rounds out this product nicely. If you are looking to save time when getting ready yet still want to look good you should seriously consider purchasing this hot air brush from Revlon.